New Wave Domesticity: ready! set! yard sale! i am a really serious yard saler. like the kind of yard saler that maps things out the night before and then goes to as many sales as possible from about 9 or 10 am until 2 or 3pm when all the sales are pretty much shutting down and i do not have a choice. it's my vice. my weekend treasure hunt. my addiction if you will. i've learned quickly that few people can handle my stamina. not everyone wants to drive around going to yard sales for 5 hours in a day even if they do love a yard sale. and then i met katy. katy is my yard sale soulmate. she can handle 5 hours of sales without a problem and she is darn good at the hunt with great insight and a keen eye for treasures. katy had been working weekends for the past year, but she just quit her job and i am pleased as punch to have my saturday yard sale date back! in addition, katy is also a really amazing friend so i love that we get to spend that super good bonding time together. who needs a $5 cup of coffee when you can go out and score 5 new dresses for that $5? 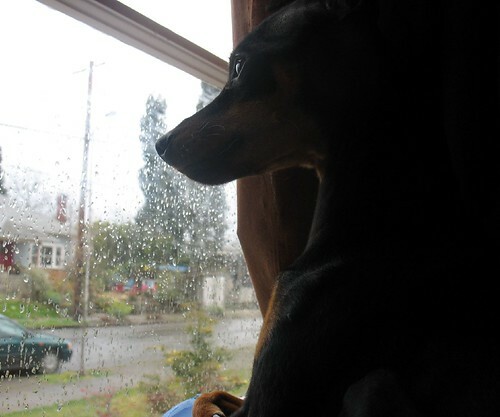 portland is still a little rainy and spring has not fully shown it's face yet, but we couldn't wait to start (given katy's new freedom and all), so we braved the rain and started our yard sale season this weekend! there were a surprisingly good amount of estate sale and rummage sale listings for a rainy saturday. we went to three church rummage sales. rummage sales are always a favorite for me. rummage sales tend to be better than most other types of sales because a)they are filled with donations from many different families in one place b)the person who prices items is usually not it's previous owner, so you are less likely to run into the "i think my junk is worth so much" kind of attitude and c)the last few hours of a rummage sale often equal half off everything or a great "fill a bag for a few bucks" kind of deal. rummage sale scores included: 2 silver chains for 50 cents (i have a lot of cute charms that need a place to go), a brand new sealed eyelash curler for 5 cents, little apple pin for 5 cents, and an amazing spinning spice rack that will take care of all of my bulk spices cluttering the cupboard (and it has a little dial that you click and it automatically measures 1/4 teaspoon) for $2. we also stopped at a few estate sales. one was in the hollywood district and was so crowded that there was a line outside even though it was well after noon. 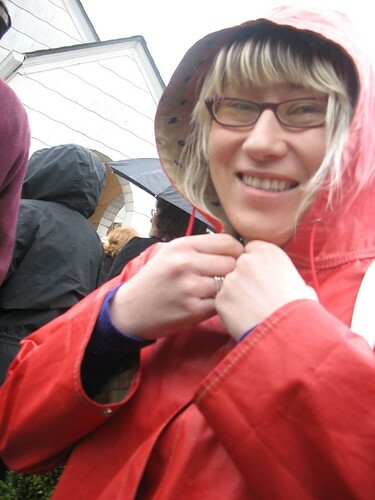 we waiting in the rain anyway and found made it in to happily pull though piles of old ephemera and vintage treasures. weirdest thing i saw this weekend? this really intense life-sized porcelain dolphin head mounted onto a brass wave like thing. i am not even sure what you would do with this. the photo does no justice to how creepy it was. also, they wanted $22 for it. my favorite finds today was a bunch of great old cookbooks that came from a few different sales and were about 50 cents each. i am excited to try out some of the jam recipes this summer in "you can can with honey" booklet. it seems that the honey can act as a replacement for pectin and sugar in most cases if you add it with tapioca flour. it will be an interesting experiment i guess! most of my heritage is pennsylviania dutch and it's influence is really prevalent in the area i grew up and though i am sadly not very in touch with that history, i was really excited to find this old book about pennsylvania dutch cooking! 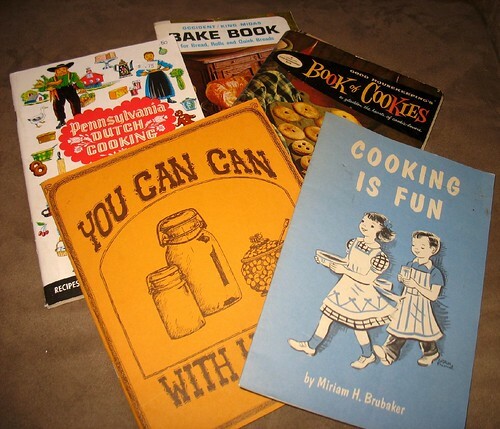 it was printed in the 50s and though a lot of the recipes are really intense and some involve pigs feet, but most of them are really nice simple old fashion cooking. i am excited to try a few of these things. 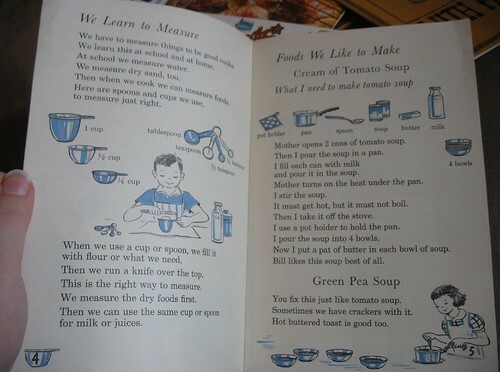 i also got a couple of other good baking recipes from the 50s about baking bread, baking cookies and this sweet kids book with step by step instructions and cute illustrations for few basic recipes. Ha! 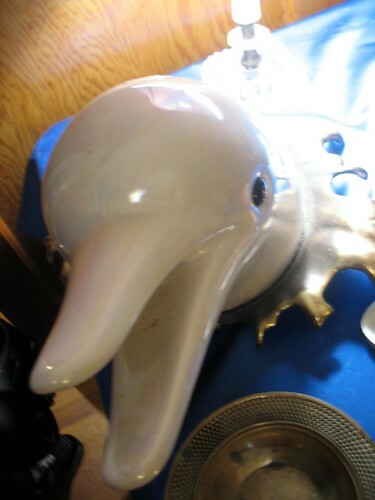 I went to that estate sale with the dolphin head and took a picture of it, too! Yeah, it was creepy. And I don't generally think of dolphins as creepy. I didn't find anything there.